These expanded steel basket waste containers with heavy gauge steel construction are designed to withstand constant use in the harshest conditions. The see-through design is ideal for city streets, airports, schools and other high security areas. Tapered design permits nesting for easy storage. Reinforced curled edges prevent clothing snags and protects against maintenance staff injuries. Available in galvanized steel or powder-coated finish. 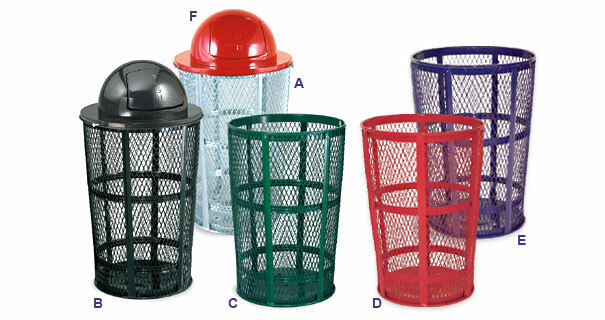 Use with model 1855 dome top	for an effective and economical critter-proof closed receptacle. Dome top features a self-closing push door and easily secures to receptacle with three included thumb screws. Top 24"Dia. | Base 19.25"Dia.